A new study challenges the tenet of herpes viruses being strictly host-specific. Scientists from the Leibniz Institute for Zoo and Wildlife Research (IZW) in Germany have discovered that gammaherpesviruses switch their hosts more frequently than previously thought. In fact, bats and primates appear to be responsible for the transfer of these viruses to other mammals in many cases. The findings were published in the scientific journal "mBio". For herpes, it has generally been thought that every animal has its own specific viruses and that virus and host species have co-evolved. Now, an international team of scientists led by the Leibniz-IZW discovered that herpesviruses may not conform to this commonly held view. Surprisingly, while studying a group of herpesviruses called gammaherpesviruses, the researchers demonstrated that the herpes viruses found in common vampire bats (Desmodus rotundus) and hairy-legged vampire bats (Diphylla ecaudata) were similar to those previously found in cattle. While it is known that vampire bats exclusively feed on animal blood, preferring domestic swine and cattle, since they represent an easily accessible food source, the result was somewhat unusual. Were bats being infected by viruses from their food source? To answer this question, researchers from the Leibniz-IZW worked together with the Centro Nacional de Investigación Disciplinaria en Microbiología Animal - INIFAP; the Facultad de Medicina Veterinaria y Zootecnia of the Universidad Veracruzana; the Instituto de Biotecnología of the National Autonomous University of Mexico, the SUNY Downstate Medical Center in the USA, and the Freie Universität Berlin in Germany. Following up on the results from vampire bats, the researchers compiled the largest dataset of gammaherpesvirus sequences to date from their own sequencing data and publicly available data, including viruses from many bat species, and performed extensive analyses to determine the relationships of the viruses to one another and to their hosts. This shows that herpesviruses have frequently switched between species in the past, rather than being host specific. Most switches derived from bats, with primates being the second most common source of switches. "We speculate that bat-specific traits such as their ability to fly and a wide geographical range might have been important in promoting a virus spillover from bats to other animal groups," says Dr Marina Escalera-Zamudio, scientist at the Leibniz-IZW. After switching, herpesviruses may have adapted to their new hosts, creating the impression of host specificity. So the vampire bats were not likely infected by their food but more likely infected by other mammals in the past. Also surprisingly, vampire bats were not more prone among bats to transfer viruses, as many viruses from non-blood feeding bats also appear to have jumped. Since many viruses that cause disease in humans belong to the herpes virus family, it is important to understand their evolutionary development. 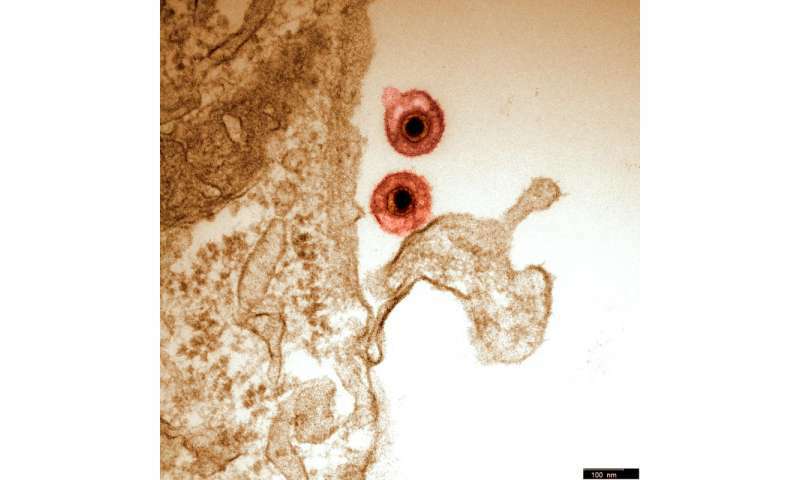 "Herpes viruses establish latent life-long infections. Although they generally cause disease only in immunosuppressed individuals, they can survive largely below the radar even after infection," Escalera-Zamudio adds. Therefore, there may be even more species switches to uncover. However, only further sampling across a larger diversity of hosts will help determine the full scale of such switches. Future efforts should concentrate on clarifying the role of bats and primates for spreading these viruses. Are vampire bats nature's misunderstood monsters?